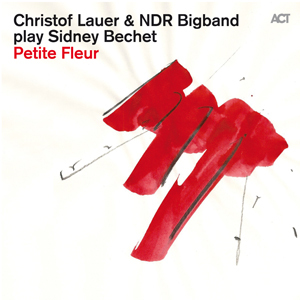 TAKING THE MUSIC of one of New Orleans jazz’s pioneers, Sidney Bechet, and significantly reimagining it for present-day big band may seem a touch audacious, and even unlikely – but this new release from German saxophonist Christof Lauer and the NDR Bigband, focusing on the output of saxophonist and clarinettist Bechet and his contemporaries, confounds any doubt with a scintillating performance. By accounts a cavalier and larger-than-life character known for his brash, wide vibrato, Sidney Bechet found success in the early 1920s, his quaint archive recordings now very much ‘of the period’. Moving on almost a century, it was ACT boss Siggi Loch (whose early introduction to jazz was via the music of Bechet) who prompted Christof Lauer to consider revisiting and reinterpreting his music. The resulting transformation is both striking and accessibly attractive, due to the insightful, lush big band arrangements of Rainer Tempel and their dynamic, meticulous execution by Lauer and the NDR. Dans Les Rues D’Antibes is a stunning opener – tuneful, and brimming with bright harmonic and percussive verve (sample Bechet’s original to understand its metamorphosis into a 21st Century sound world!). The NDR Bigband have a history of recordings with great instrumental leaders (Joe Zawinul, Alan Broadbent, Mark Lockheart, Mike Gibbs, Norma Winstone…), and here they share a similar affinity with Christof Lauer who, perhaps echoing the flamboyance of Bechet, dazzles with rapid ascending and descending soprano runs. This arrangement grows with multi-layered complexity, including expansive piano work from Hubert Nuss; and a deliciously close-knit saxophone ensemble interlude crowns a tremendously joyful number. The original, fast-paced quirkiness of Les Oignons is magically interpreted by Tempel into mid-tempo brassy and reedy sumptuousness, Fender Rhodes completing the downtown ’70s feel. Following Lauer’s own lissome solo interlude, September, the impetus of Bechet’s Petite Fleur is maintained by a muted, questioning big band backing, Lauer’s soprano showboating against Patrice Héral’s incisive drumming and a riproaring trumpet solo; meanwhile, the Arabic impressionism of Casbah – Song of the Medina smoulders to a mysterious Rhodes ostinato and trombone counterpoint, conjuring filmic images of subterfuge and high drama. Similarly, that twee, trad. memory of Fats Waller’s Honeysuckle Rose that I carry in my mind now becomes, in the hands of Lauer and the NDR, a slowburning, eight-minute thriller movie prelude, bright unison brass and electronics supporting Lauer’s rich tenor lines. The jaunty, homely Si Tu Vois Ma Mère connects more readily to Sidney Bechet’s Louisiana roots – a charming offering led by Lauer’s soprano, though not without a strangely sinister undercurrent; and Harry Barris’s Wrap Your Troubles in Dreams – a number Bechet would, no doubt, have held in his repertoire – is brought right up to date with a funky, smooth jazz slant. Finally, Jimmy McHugh’s classic On the Sunny Side of the Street melts the heart with Tempel’s sophisticated-yet-carefree big band arrangement, Lauer’s ‘Bechet’ taking the final, showy bow. It’s a glorious project whose intention captures my imagination, recalling Sidney Bechet’s early contribution to the genre, but also demonstrating the relevance of our current jazz scene in arranging and improvising bygone standards for a new and, in my experience, receptive generation. Released in the UK on 2 June 2014, further information and audio samples are available here.